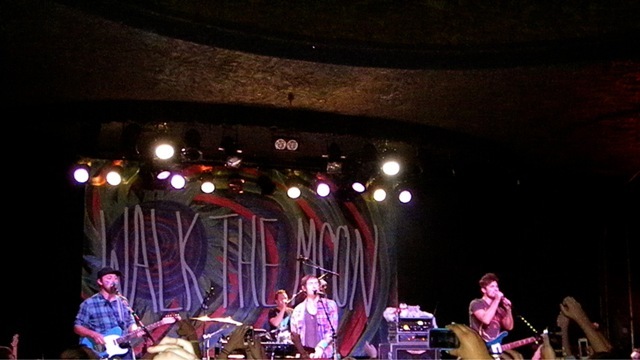 Walk the Moon brought their fun and fancy free stylings to the Showbox Market in Seattle on the Friday after Thanksgiving. They played through all the hits from their self-titled release amidst a sold out dance party filled with folks with painted faces and Thanksgiving food coma hangovers. Unlike the day before, people couldn’t stop moving into the night and were fully entertained by one of the grooviest bands hitting the scene today. The guys kicked off the show with “The Liftaway” followed by Walk the Moon opener, and a personal favorite, “Quesadilla”. This track solicited clapping and shouts of “Hey!” throughout, setting the tone for the evening. By the end of the second song, hands were in the air, feet were tapping, and hips were shaking; all without sign of ceasing. The dance party continued with “Next in Line” and my personal favorite, “Shiver Shiver”, complete with Super Mario Brothers Theme Song intro. WTM were consistent in showing their gratitude, thanking the crowd for being there and providing support several times throughout the evening. In a recent interview, Nicholas Petricca noted that this was the biggest tour they’ve headlined and their appreciation for this showed constantly. They absolutely owned the big crowd at the Showbox from the jumping fans down in front to the head bobbers in the bar, receiving massive ovations at the beginning and end of each track. The boys grooved through “Tightrope”, among others, before landing on “Iscariot” and “Fixin’”, which are the more serious tracks on the album. After slowing the jams down a bit, they kicked right back in with another personal favorite, “Jenny”, and their biggest hit, “Anna Sun”. After finishing up their first trip onto the stage, Walk the Moon came back out and played a little David Bowie number, “Let’s Dance”, before closing out with their anthem of positivity, “I Can Lift a Car”. They encouraged the crowd to lift their troubles and doubts above their head, shake them around, and leave them there in the venue instead of taking them back when they left. This statement and encouragement encapsulates what Walk the Moon stands for and delivers; positive feelings and smiles on painted faces.